Mega Monday Announcement – The Write Romantics are One Year Old! Alex – It was a very lucky day when I went to a writer’s lunch in York last March and met Julie. She and Jo had just set up the blog and I was delighted to get involved. I never expected to meet such a fantastic, warm, supportive and generally amazing group of ladies as the Write Romantics. I was in my first year of the NWS when I joined and was just finishing my first novel. I’ve learned so much from the other members of the group and they’re always willing to share their advice and experience which has been such a big help to me. Let’s hope that we have lots more anniversaries to celebrate! Jackie – Have had the best year ever since I joined the Write Romantics. It’s been such a confidence boost to share the journey to publication with these fabulous ladies and feel it’s only a matter of time before we all become published writers. Julie – Being part of The Write Romantics has been one of my greatest writing achievements. We live all over, we’re different ages, we write different genres and like different things and yet we come together to provide such an incredible support group and inspiration for each other. I feel like something’s missing in my day if I haven’t communicated with the other WRs! Lynne – The Write Romantics is a brilliant group. You can’t beat the support of a lovely group of wise members like these. Its brilliant that they know exactly what you mean about writerly things too. And when the need arises, there’s enough of us that there’s generally someone around online, but it’s not a big enough group that we don’t get to know each other well. Deirdre – This year has been the absolute best in all the years I’ve been writing because I’ve been able to share it with my fellow Write Romantics. We celebrate with each other, we commiserate, we moan and groan, we cheer one another on, we laugh, and above all, just knowing there’s somebody there who truly ‘gets’ this writing business is priceless beyond belief. Long may it continue! Rachael – Joining The Write Romantics has been a fun experience. To have had the support of such wonderful writers over the last year has been invaluable. You can’t beat sharing the highs and lows of writing. The blog is brilliant and it’s great to have the deadline of coming up with answers to all the Wednesday Wonderings. On the Saturday Spotlight we have had some really great guests and interesting posts from The Write Romantics. I’m looking forward to the next year! Helen R – Writing is a lonely occupation so when the opportunity came up to join a blog with other like-minded people, I jumped at the chance and to be honest, I haven’t looked back since. I feel especially privileged to be a part of The Write Romantics because I live overseas, in Sydney Australia, and so I wasn’t sure whether the blog group would rather have had UK residents only. Luckily for me, they didn’t! We all have our good days and our bad. When we work in an office it’s often our colleagues who are there to lend an ear and to vent our frustrations, but as writers we only have ourselves for company the majority of the time. The great thing with The Write Romantics is that we all seem to have our down days at different times which means that the others are there to pick up the pieces, even from thousands of miles away, and the support isn’t necessarily writing related. I’ve met these friends online and never come face to face with any of them, yet our close knit group is going from strength to strength supporting each other with our writing woes, celebrating our triumphs, making each other laugh and lending an ear when its needed. Without the support of these wonderful ladies, I know that I would be struggling so much more in the journey towards publication. And the next brilliant part for me is that in July of this year, I get to meet each and every one of The Write Romantics at the Romantic Novelists’ Association conference! Jo – As everyone else has said the camaraderie is just the most fantastic thing and I know for a fact that I have made friends for life amongst this group. I have rejoiced in the other WRs’ successes and been offered a virtual hug when I needed it most. I have also been privileged to *meet* and interview lots of fantastic writers, who have been guests on the blog, and who have generously shared their time and expertise with us. We really hope you will pop along to the party to say hello and thanks to all those of you have offered us so much support in our first year. March 31st sees the start of National Stationery Week and I love stationery. I mean what’s not to like? My desk is a shrine to it. Everything I might possibly need, neatly arranged. 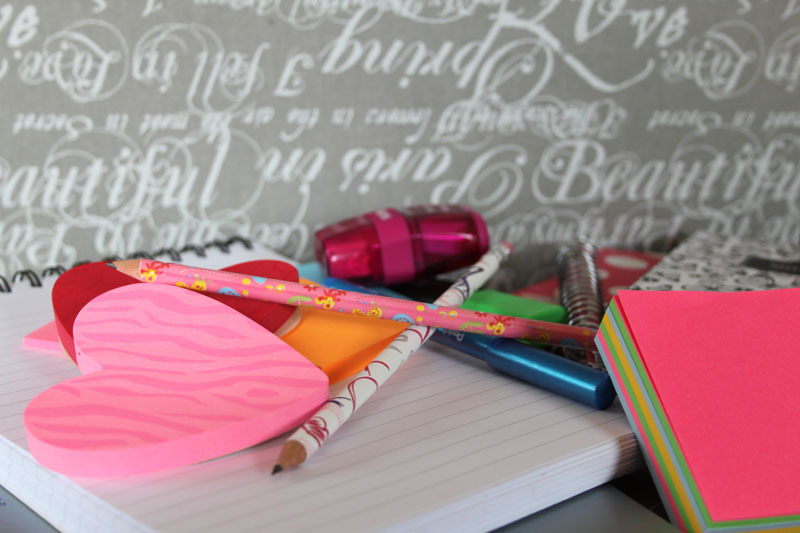 From post-it notes and pencils, to highlighters and notepads, they all have their place. Those that don’t fit on my desk have a lovely box in which to wait their turn. So there isn’t ever an excuse not to buy more stationery! But the idea of National Stationery Week isn’t to adorn my desk further with items I just have to have. Shame! No, it’s to get people writing – by hand. This I already do. Nothing gives me greater satisfaction than writing by hand. I favour a pencil and find if I’m ever stuck with a story, some good old fashioned scribbling does the job. If you check out the National Stationery Week website you’ll see there are some other suggestions. One that jumped out at me was to go on a stationery crawl. How can I resist that one? There are also loads of other great suggestions, but the important thing is to spread the word and get people writing by hand. From the picture of the contents of my stationery box, you’ll probably guess that notepads and post-it notes are my weakness. All stationery is really, but those two things have some sort of mystical power over me. What about you? What is it that you just can’t resist buying when you are in a stationery shop and do you enjoy the feeling of actually putting pen or pencil to paper instead of fingers to keyboard? I wasn’t very impressed with poetry at school. I couldn’t see the point of all that in depth analysis, picking the bones out of every word and trying to second guess what the poet actually meant, then spewing it all out on paper for the examiner to take pot shots at. It wasn’t until some years later that I discovered poetry for myself and began a collection of favourites which I typed out on an old manual typewriter. One of these was ‘Stopping by Woods on a Snowy Evening’ by Robert Frost. I love the simplicity of the language and the down to earth quality of his poems. It was Frost, of course, who famously said: ‘No tears in the writer; no tears in the reader’. What better maxim do we need to remind us to raise the emotional stakes in our writing? I asked the Write Romantics: What is your favourite poem? Perhaps it’s a Shakespeare sonnet, a nineteenth century romantic poem, a haiku, or a hilarious ode by Pam Ayres; the choice is endless, but if there isn’t a poem you love, perhaps because you were put off poetry at school, tell us about that instead, or even, dare I say it, give us one of your own. But the two poems that stick in my mind is: At Lunchtime by Roger McGough. It’s about people making love on a bus at lunchtime because someone said it was ok as the world was going to end. The other one is: In Flanders Fields by John McCrae who was in the first world war (I’m guessing most people know this poem). Coincidently, as I googled it because I couldn’t remember the poets name, I came across another very good poem by Roger McGough called the Square Dance, which is a parody of John McCrae’s poem, In Flanders Fields. Well I never! My favourite poem is ‘He wishes for the clothes of Heaven’ by W.B. Yeats. It is hugely romantic and beautiful and I can’t help but feel that only an Irishman (or woman) could have written it. I adore the last line ‘Tread softly because you tread on my dreams’. Supposedly Yeats wrote the poem for Maud Gonne, a beautiful English woman who he was hopelessly in love with for many years. She really didn’t tread softly on his dreams as she turned down his many proposals and eventually (and unhappily) married someone else. Hmmm. Tricky. I don’t tend to read poetry. I like the amusing stuff a la Pam Ayres (very talented woman) and I don’t understand the other stuff. To me, poetry should rhyme! Other than the famous “I wish I’d looked after my teeth” I couldn’t specifically name anything Pam has written so I’ll instead say a poem from my childhood. In junior school, we looked at The Jabberwocky by Lewis Carroll. The lesson was all about what words mean and how words can be made up but you can still understand what they mean by the sound or the context. I must have been about 8 or 9 and I still remember this lesson in detail. I was so enthralled that I went away and learned the poem. Thirty two years later, I can still recite it word for word and I still think it’s magical! A particular favourite word from it is “mimsy”. How wonderful is that? We did a module on poetry as part of my masters and it was heavy going. I don’t think my talents lie in poetry, put it that way! It’s so much harder to write poetry than we think, with so few words to capture a moment or tell a tale. During that module we listened to a couple of Pam Ayres poems and I admire her extraordinary talent. Her voice as a narrator works so well too and brings her poems to life by adding emotions behind them. …which is just about all you need to know to be able to ‘see’ her. I’m afraid I don’t like poetry, it’s not to say I don’t admire some poems and I do appreciate listening to poems that fellow writers have written. But it has always been one of my least favourite things and the thought of writing one fills me with fear. I have a friend who does write some very funny poems and these are excellent but it’s not something I would choose to write or read for pleasure myself. My favourite poems are those which make you go, ‘aaahhh,’ at the end, not those that we studied at school, the hard, serious ones though I love anything by Thomas Hardy. To me those by Pam Ayres, Jenny Joseph and even Roald Dahl are just much more fun. I could really never take to T. S. Elliott. My favourite is by a certain member of the Write Romantics, it cheerful, sweet, and just great fun! another romance writer, just as round the bend. convinced we’d soon be breakfasting on caviar and toast. so we had to find some other friends to widen our appeal. good luck to the bloke who gets the job, they’ll be nine of us and him! See what I mean about a treat? Thanks, Jo, it’s brilliant! Such a variety of replies here; I hope you’ve enjoyed reading them as much as I have, and please feel free to add your own contribution. We’d love to read it. March is nearly over, which means this is my last Wondering for a while. Next week the hot seat will be occupied by the lovely Helen Phifer, author of The Ghost House. When I was young my Nan suggested that I should be a singer when I grew up. ‘You have a good voice,’ she said, ‘you could be one of those pop stars on the telly,’ as if it was as easy as sending a ten year old down the corner shop to buy ten Woodbine and a bottle of stout. What a great idea, I thought. I could just picture it, little Jimmy Osmond and me duetting to Long Haired Lover from Liverpool as the crowd cheered and Tony Blackburn hailed me as the next Lena Zavaroni. Shouldn’t really have taken her as literally as I did, I know; this was the Nan who wrote to the Evening Sentinel in Stoke-on-Trent suggesting that all the foreigners be housed on a boggy piece of unused land near Rugely bypass. But I took her advice to heart and somehow wangled a second-hand guitar and set about playing it, so I could sing along to a tune. Cue me, hunched over the three bar electric fire in the kitchen strumming the first line of ‘Ride a white Swan’ over and over, until everyone’s ears bled. Mum bought me a book of ‘Easy Tunes for the Beginner’ (cheek!) as I got stuck after, ‘Swan,’(he knew some tricky chords, did that Marc Bolan) but ‘Greensleeves’ and ‘Flies in the Buttermilk’ were never going to get me on the stage in blue velvet flares and Gary Glitter sized platform shoes. So even though my fingertips had toughened up so much I could carry plates straight from the oven on to the dinner table, and could change to B7 without looking, I just stopped playing. I had realised how long it would take to become proficient and I didn’t want to give that much time to improve my meagre talent – I wanted it all immediately. I wish I’d stuck at it. I’d be pretty good by now. This has nothing much to do with being a writer, you might have noticed, but getting published is my new dream and don’t intend to give it up as easily. This writing game is harder in a way as there are no rules to guarantee success. And it doesn’t just take a few hours out of your week; it eats up great swathes of your life, you swat your children out of the way of your computer screen, you develop writer’s arse, and wine becomes your best friend. (Okay, it was pretty close ally to start with) It’s a real uphill battle and it’s hard work, but I know I can’t stop until I’m done. Never did get the blue velvet flares and I walked like a duck in the platforms, but my Nan was mighty proud of my guitar playing and I think if she’s still looking down on me, although I’m not yet published, she’ll be mightily proud now. The Wednesday Wondering: You’re Fired! If you share my (dubious) tastes in TV programmes you won’t be a stranger to the title of this week’s Wondering. Yes, that’s right. The famous phrase comes out of Alan Sugar’s mouth at the end of every episode of The Apprentice. Whether you find it compulsive or repulsive viewing, you’ll be sure to know what it’s about. Hard to avoid, isn’t it? If you could be apprenticed to a well-known writer, have access to their innermost thought processes while they write and have them mentor your own novel, who would you choose? (Time machines permitted) And what would you hope to learn from them? The Write Romantics were spoiled for choice, as you’ll see. I’d love to be apprenticed, Write Romantics excluded, to Jojo Moyes. I loved ‘Me Before You,’ and am now totally loving ‘The Peacock Emporium,’ recommended by Deirdre. Her stories are so good, yet what I really love is her emotional descriptions. You really feel like you are there with the characters, learning first hand what they’re seeing and thinking. I love tales that are rich in emotion and these you just can’t beat! It would have to be my hero, the amazing Mr Stephen King. I would love to see how he plots his books, how he comes up with his ideas, where he stores them but most of all I would love to sit behind the desk that he writes at and just soak up the vibes. It would be even better to have his personal input and advice into a story I was writing. The only thing is I fear that if I ever did get to meet him I wouldn’t be able to speak because I’d be so in awe of him or I talk a load of absolute rubbish and bore him to death. I would hope to learn just how to keep on going and producing book after book which was a best seller around the world so that I too could have a writing room just like him. Can I only pick one? It would be between five people (all women) – Enid Blyton, Virginia Andrews (the original one who passed away), Catherine Cookson, Jill Mansell, Marian Keyes, so a time machine would be needed for 3 out of 5! All of them have had a lasting impression on me for getting me engrossed in books at different ages with the latter two being about my discovery of romantic comedy. For all, I’d love to explore where their ideas came from, how they develop their characters and how they plot out their books because all of them, in my opinion, have written page-turner after page-turner. What an amazing talent to have! I’d like to be mentored by Alexandra Sokoloff. She’s an award winning author of thrillers – not my genre and even the book jacket blurbs scare me, but I think she has such a wealth of knowledge about techniques in both film and novels. I attended the online RWAus conference in 2013 where Alexandra Sokoloff hosted a workshop and since then I have read and re-read her book “Writing Love” many times as it helps to plot a new story, prevent it from having a “saggy middle” and give readers what they want. She also advocates watching films to help us master storytelling techniques, and this works really well for me, I’d definitely recommend it. I’d choose to spend my apprenticeship with Ian Rankin because although I’m not a great lover of crime fiction, I do admire his writing. It never feels forced or over-written; he never rambles but makes every word count. That’s the kind of writing I’m aiming for and hopefully something of that would rub off. I saw a documentary in which Ian agonised over his plot and confessed he had no idea what came next in the book he was writing. Heartening to note that even the famous ones can be plagued with self-doubt! It would be fascinating to be with him at those moments and see how he gets around them. Also I’d get to see Edinburgh which I understand is a beautiful city, and, from what I’ve gathered of Ian’s lifestyle, spend a lot of time in the pub! This is an easy one for me. It would definitely have to be Charles Dickens. I’d want to learn how he created such memorable characters and wrote such a range of stories that could transcend generations and give quite moral messages, yet avoid being cheesy or overly sentimental. If an apprenticeship with Dickens could give me a cat in hell’s chance of writing something that leaves a legacy as embedded in our culture as say A Christmas Carol or Oliver Twist, then it would be well worth risking particle displacement on a trip in a time machine for! I would quite like Jilly Cooper to mentor me because I know I'll never write literary novels so would be happy with learning how to have a page turning quality. I also think she's be a good laugh as wouldn't like someone who took it all too seriously (although I would love to write like Anita Shreve and have deep understanding of emotions). Hopefully it would be gin time at four in the afternoon and I would roll home sozzled and happy. If I could take any writer, go back to any time I would chose two. Greedy I know, but there you go. Firstly I’d love to be an apprentice to Maeve Binchy. Each time I’ve picked up a book of hers, I’ve been hooked and that is what I’d love to learn from her. How to hook the reader and keep them hooked. Not only that, but how to make your story have such an impact that the reader can still ‘see it’ in their minds many years later. I have two favourite books of hers, Circle of Friends and Tara Road. Once that was done, I zip back in time to sit with Jane Austen. Now that would be something. I’d just love to be with her as she wrote Pride and Prejudice, I’d love to know what she thought of the characters she was creating and did she ever believe it would be such an everlastingly popular story. Well, it’s a bit of fun, isn’t it? Perhaps you’ll find a moment to tell us where your dream apprenticeship would take you. We’d love to know. Our guest on the blog today is Isabelle Goddard, who writes for both HMB and the Wild Rose Press. Isabelle was born into an army family and most of her childhood was spent moving from place to place, school to school, including periods of living abroad in Egypt and Germany. 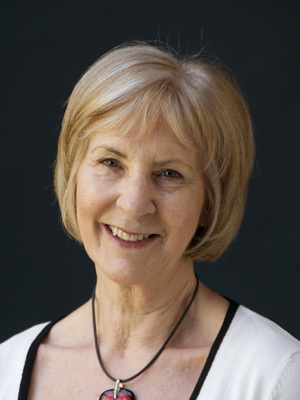 Isabelle has had a varied career path, swiftly deciding that the role of secretary was not for her and moving on to work as a member of the cabin crew for an airline, which led to some encounters with interesting people and some great experiences – riding in the foothills of the Andes, walking by the shores of Lake Victoria, flying pilgrims from Kandahar to Mecca. The arrival of marriage and children and cats meant a more settled life in the south of England where she’s lived ever since. Isabelle returned to study, eventually gaining a PhD, and for many years taught English at a number of universities – loving every minute of it. Having always felt an affinity with the 19th century and growing up reading Georgette Heyer, when Isabelle finally plucked up the courage to begin writing herself, her novels had to be Regency romances. Isabelle was delighted when her first book was accepted by Harlequin, Mills and Boon just before Christmas 2009 and even more delighted to publish five more Regency romances over the next few years. Recently she has moved away from pure romance and begun writing more mainstream women’s fiction under the new name of Merryn Allingham. Isabelle is currently two-thirds of the way through a trilogy set in India during the 1930s and 1940s and though these novels still include some romance, they also offer elements of mystery and suspense. Welcome to the blog Isabelle and thanks for agreeing to an interview. We’d like to begin by asking what is was that made you start writing, how many books have you written and if you see yourself ever stopping? While I was working full time, I ‘tinkered’ with writing. Short stories mainly, simply because they were short and I could fit them into a busy schedule. It was only when my workload decreased and I gradually slid into retirement, that I had the time to tackle something more substantial. I’ve written nine novels in the last five or six years. Six have been published, one is in the process of being published, and the other two are part of a trilogy I’m currently working on. At the moment I love writing so much that I can’t imagine ever wanting to stop. Do you write full time or have another job? Apart from teaching the occasional creative writing course or workshop, I don’t have a job. For many years I worked as a university lecturer teaching English Literature, so it’s wonderful to focus on creating rather than analysing. What genre of romance would you say you write in and have you thought about trying any other genres, either of romance or something else? I’ve been writing historical romance for the last few years, but am gradually moving towards romantic suspense/mystery romance – still historical – but more mainstream women’s fiction. How did you get your first break into publishing, how long did it take and what did ‘getting the call’ feel like? I sold the first novel I wrote to Harlequin, Mills and Boon but it took an age before I actually ‘got the call’ – something like two years between original submission and acceptance! When HMB finally rang, I remember I was sitting on the sofa feeling doleful with a bout of December flu. But despite the coughs and splutters, it felt pretty special hearing an editor say I was being offered a two book contract. What has been your greatest writing challenge and how have you overcome it, if you have? The main challenge has come from the job I did. I spent years teaching some of the greatest prose ever written and that’s pretty daunting when you’re considering putting pen to paper yourself. I had this mocking voice in my head which kept telling me not to bother. It took time to banish it. In the end, I managed to accept that I was never going to be Virginia Woolf! Instead I could be me and that could be fun. It was tremendously liberating when I broke through that barrier and allowed the words to come. Some of them were pure rubbish, of course, but in the middle there was the occasional nugget of gold which made me want to go on trying. What would you consider your greatest writing accomplishment to be? This question got me scratching my head, mainly because ‘great accomplishment’ doesn’t seem to fit where I am at the moment. With every book I write, I try to do better but I’m a long way off from feeling satisfied. How do you plan your stories and develop your characters and do you ever worry about repeating patterns or themes in your writing? The genesis of each novel is different. The trilogy I’m currently writing, for instance, sprang from my own family. My mother sailed to Bombay in 1937 to marry my father, not having seen him for six years. It’s a story that has always amazed me, plus the fact that I love India and all things Indian. So I used it as a jumping off point for my heroine, Daisy’s, story, which unfortunately doesn’t work out quite as well as my mother’s did! I know my main characters before I begin to write. I sketch out as many details about them as I can and I know where I want them to start and where I want them to end. But what happens to them in the middle seems to grow as I get to know them better, and the secondary characters emerge in response to the story that is developing. As for patterns in writing, I think every author tends to repeat some of the same ideas and themes. When you write, whatever your story, you’re expressing part of yourself so it’s bound to happen. But setting novels in different historical periods – I’ve done Regency, Victorian and now the 1930s/1940s – has given me the chance to deal with different cultures and different societal expectations, and hopefully that’s prevented too much repetition. Do you alter your writing in any way to appeal to international readers and do you have to change your writing style to meet the differing needs of your two publishers? No, I don’t deliberately alter my style for different publishers or different audiences. HMB always use English spelling and punctuation and they also keep intact the particularly British aspects of the ms. I think they feel the English setting and language is what attracts readers in the first place. The US publisher, Wild Rose Press, required North American spelling and punctuation and that meant a little more work on my part. It’s a strange fact that though US spelling simplifies, their punctuation is more complicated. It’s the punctuation I was taught at school but which in the UK is now seen as unnecessary. I had sometimes to modify phrases the American editor queried, phrases that might not be easily understood by an American readership, but at other times she was happy with my request that the phrase stayed. Working with an editor is always about compromise and it can be a great learning experience – on both sides! Have you ever considered self-publishing? I did try and self publish once, a novel which is now being published by Digital First. My efforts weren’t a great success! Apart from the fact that I’m technologically challenged, I hadn’t a clue about marketing and how much ‘push’ self published books need to get off the ground. What do you think helps most in getting your books noticed in a crowded market place and how involved are you in the marketing process? I’m still struggling with this one! I’m sure that luck comes into being noticed but equally sure that it’s also down to astute marketing and making the right contacts. I’ve gradually been dragged more into the marketing side – I have a website, a blog, a facebook author page and a twitter address. But I’m pretty hopeless at keeping any/all of them going and like many writers, I’m not a ‘Buy my Book’ type of person. I just enjoy writing. What are your plans, hopes, dreams and aspirations for the next stage in your writing career? I’ve enjoyed writing category historical romance enormously and I’ve learnt lot in doing so, but I’m ready now to broaden the scope of my writing. I’m hoping to move into mainstream women’s fiction but since most of the major publishing houses don’t take unsolicited manuscripts, it means finding an agent. I’m not holding my breath but occasionally miracles do happen! The Wednesday Wondering: Spring has sprung! It isn’t quite true, of course; strictly speaking, spring doesn’t begin until the vernal equinox on the 20th of the month. But the days are growing longer, the daffodils are brightening our parks and gardens and spring is, after all, the season of romance, so I thought we’d jump ahead and celebrate with a spring-themed Wondering this week. 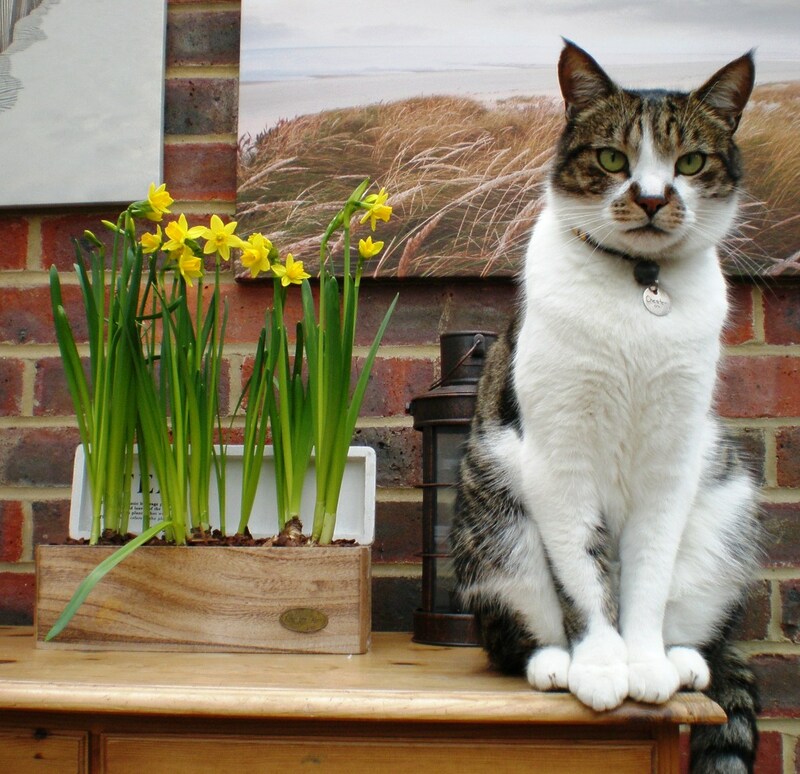 Also, it gives me a great excuse to give my cat Chester his moment, although as you can tell from the photo he wasn’t impressed! One ritual we’re all familiar with is spring cleaning, which dates back centuries and has its place in every culture. In ancient Persia they called it khooneh tekouni, which literally means ‘shaking the house’. I like that. But whatever its origins, spring cleaning is still a dot on the calendar in many homes today, especially for the older generation. – What does spring mean to you? – Kirstie Allsopp triggered a mini media furore when she declared her love of ironing. Whether you spring-clean or not, what’s your favourite, and least favourite, household chore? Spring means to me, Mothers Day, daffodils, bluebells, hints of summer to come (wishful thinking), snowdrops, cherry blossom on the trees, walks through the woods, relief that the nights are getting lighter and a general sense of well being that winter is finally over. My favourite household chore would be, erm let me think? Nope, sorry I can’t think of a single household chore that I enjoy doing. They are to me a chore and take up my precious writing time. My least favourite chore is cleaning the windows. I don’t know why I picked a house that had four windows in the living room; it’s an absolute nightmare. Talking about cleaning windows I should probably make an attempt at cleaning them because everything outside is a blur at the moment and I don’t want to miss my gorgeous bluebells when they flower in my front garden. There’s a lovely feeling of coming out of hibernation in spring. With the first daffodils and crocuses I feel like I can look forward to longer days, warmer weather and putting my winter coat away. As I live in Yorkshire there’s a good chance that it’ll be another month yet before the winter coat gets shoved to the back of the wardrobe but I always feel more hopeful in spring and that I’ll get me through any unpredictable days that March may throw at me. I wouldn’t go so far as to say I love ironing but it’s probably my favourite chore. I usually do it while catching up on the Radio 2 Folk Show on the iPlayer. I’m pretty rubbish at all other forms of housework but I particularly hate window cleaning mainly because they always look worse after I’ve done them. I’m not a “cleaner upper” type person and in fact now have a cleaner after years of ‘almost’ arguments in our family that were mostly down to the state of the house. I was mortified once when a handy man asked where the hoover was so he could hoover bits of wood shavings up, and I didn’t even knows how it worked ( husband seemed to like hoovering so I was happy to let him do it, although “like” is probably not the word he would use!) The cleaner has never cleaned my ‘office’ cos it is too full of paper, computers, computer bags, cushions I no longer want and general debris of life. Spring makes no difference to this. It could be shaking all the newly opened buds on the planet in my face and I would still find something better to do than spring-clean the house. The only housework chore I ever almost quite liked, (but not really) was ironing. That was in my singleton days when I would only iron what I was going to wear that night and more likely than not had a glass of wine on the go and U2 thrumming away in the background. I did quite like Fairground Attraction too- remember them? ‘It’s Got to Beeee… Perfect! Ahh, those were the days! I like the cold weather but I like the sunshine so spring for me is a lovely season because the temperature increases but not to the extent that you’re all sticky and tired (which I hate about hot summer days). I love the colours that start appearing in gardens and I adore seeing the sides of roads become a sea of daffodils. So simple. So pretty. Hate it when they die and you’re left with this overgrown patch of mess, though! As for the other part to your question, I love Kirstie but I think we’re going to have to disagree with each on this because ironing is the grimmest of tasks. I hate it. My poor daughter has often had to go to school in an un-ironed blouse or polo shirt (“just put a pinafore on; nobody will be able to tell!”) because I’ve failed abysmally to do it over the weekend. I can just about cope with it if I put a film on and focus on that instead. Oh, and don’t get me started on hoovering …. Ah spring! It blows all the cobwebs of winter away doesn’t it? I ride with riding for the disabled once a week and there is a point in spring where snowdrops and primroses replace the wonderful world of funghi and crisp, brittle branches. My favourite of all is the violets though. I love the scented varieties and the beautiful purple colour. I have a vision of an Edwardian lady selling bunches from a basket in Covent Garden. Maybe I’ll put her in a book one day. I have to say I am not great at housework and very rarely iron. Clothes that deliberately have the crinkled look to my mind are the greatest thing since sliced bread! I get by with doing just a minimum. Well, I gotta find time to write somehow haven’t I? Spring to me means bluebells. The woodland that surrounds the countryside near my home becomes carpeted in top-heavy, nodding flowers which push aside the fallen leaves from autumn and winter and herald that warmer weather is on the way. At least that’s the theory! Spring to me means light, uplifting days and beautiful weather that’s neither too hot nor too cold. Spring and Autumn are easily my favourite seasons in Australia for this reason. It’s a cliché, I know, but spring gives me that lovely feeling of starting afresh, with the garden coming to life and the sun just warm enough to have my morning coffee outside. I love to see the primroses and bluebells appearing too. I have happy memories of plunging through woods gathering these flowers to take home, which of course was before we knew better and the woods were shut off, but enjoying them in their natural surroundings is just as special. As for the chores, I’m kind of with Kirstie on the ironing. I don’t do it unless I have to – nor anything else housework-related – but I have been known to enjoy a spot of ironing as it’s a warm, peaceful kind of thing and I usually have the radio on, something calming like Woman’s Hour. What do I hate? Plenty, really, but let’s say cleaning the bathroom because it only seems to look OK for about five minutes before it looks like it needs doing all over again – and there are only two of us in the house. How does grouting get that awful brown colour anyway? That’s one of life’s mysteries, if you ask me. Spring. A time for clearing out the old and letting in the new and that is echoed in nature as the garden comes to life again after the long winter months. All winter, I long for the lengthening of the days, the warm sunshine and splash of colour as daffodils, primroses and other spring flowers push up from the cold earth. It’s also a time for tidying up and when I get that urge nothing is safe. My usual quick whizz with the vacuum and flick of the duster goes out of the window. Items that have sat collecting dust, sometimes for a few years, are suddenly under the spotlight as I get into just about every corner I can. Thankfully, this sort of cleaning is only usually an annual occurrence; otherwise I’d never find the time to write! So, that’s us. The Write Romantics clearly love flowers and all things spring-like – not so sure about the chores! Do join in with your comments – it’s great to hear from you.